Home to the best in traditional Native American art, Gallup expands its creative reach to build a better community. Above: Grace Rosario Perkins works on her pop-up exhibit at Loom Gallery. Photographs by Brian Leddy. LOOM&apos;S GALLERY EXHIBIT space—a three-by-ten-foot leftover storefront on downtown’s Coal Avenue—seems better suited to a walk-in closet. But Gallup’s scrappy, can-do air occupies it as fully as Grace Rosario Perkins does. 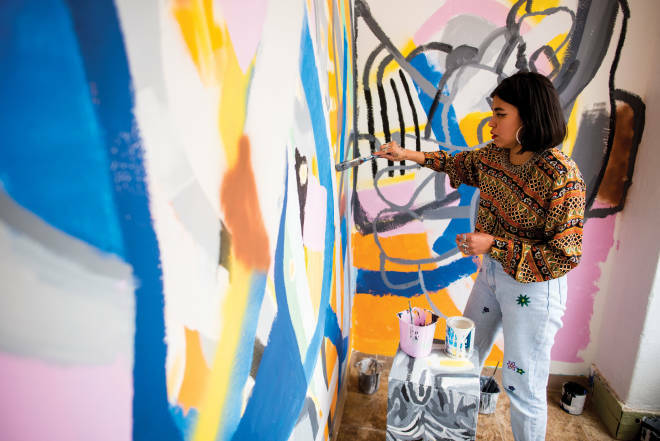 A Navajo artist who wears the bold lipstick and chic hairdo of her New York–to–California career, she paints abstract shapes on the walls and crafts papier-mâché pots. He’d Be a Mountain, She’d Be a Hill is her monthlong pop-up exhibit at Loom. It pays homage to her late grandfather, the mountain to her hill, and enforces her stand against a stereotype. What’s authentic Native American art? What does the future hold for a place tied to a particular and often copied brand of it? Can non-Native artists find a toehold, too? The short answer for Gallup these days is this: Anything goes. Loom is one example—an offshoot of Gallup Arts, a cutting-edge, all-comers nonprofit that also runs the larger 123 Gallery, workshops, wine-and-painting events, a new artist-in-residence program, and a monthly ArtsCrawl that turns Coal Avenue into a carnival of creativity. IN THE DECADES BEFORE I-40 sliced through the city’s midsection, the Santa Fe Railway and Route 66 enticed travelers to stop and give Gallup a visit. Navajo and Zuni artisans sold directly to visitors and to the trading posts that still crowd along Old Route 66, across from the railroad tracks. Starting in 1922, the Gallup Inter-Tribal Indian Ceremonial drew Native peoples from throughout the Southwest for a week of dances, music, rodeo, powwows, and an art market that gained a national reputation. The gathering fired up the downtown area. Older residents still remember the heyday with a note of nostalgia. But in the 1950s, I-40 roared in and Ceremonial fled to Red Rock Park, about five miles east of Gallup. There, it experienced both successes and a few stumbles, but it holds on to its title as the nation’s longest continuously run tribal gathering. Still, the extra five miles represented an odd sense of dislocation for Gallup. And all year long, I-40 drivers missed the town’s stoplight-by-stoplight ability to tempt them into pausing to shop. Gallup continued calling itself “the Indian Art Capital of the World,” but Santa Fe and Phoenix siphoned off its best artists for their annual markets. “We need to reclaim what’s ours,” Lazarz says. So as Ceremonial notches its 97th mark, August 3–12, its art show boasts new sparkle—and a complementary event on those downtown streets. Credit for that goes in part to Emerald Tanner, the third generation in her family to help run Tanner’s Indian Arts. Opening the door at the family business just a few doors down from where Perkins is working, she wears an elegant array of silver jewelry and glides past a veritable museum of weavings, carvings, and mine-by-mine displays of turquoise. At a table in the back, she introduces Diné artist Jerry Brown, who painted the image for this year’s Ceremonial poster—a hummingbird surrounded by shapes and colors that hint at the speed of its beating wings. Brown latched on to abstract art during his Institute of American Indian Arts studies, in Santa Fe, and soon became a favorite of the Tanner family. Most often, Brown says, he taps into those feelings during traditional Navajo ceremonies that he then interprets through layers of paint, rocks, wool, glass, ceramics—whatever moves him. “To be an abstract person and stay in your lane, that’s the hardest thing,” he says. That he says so in a trader’s hall underscores his difficulty. Traditionally, traders have served as the gatekeepers of traditional art and, sometimes, its profiteers. But traders like Tanner know they must nurture new interpretations to feed next-gen collectors. This year’s Ceremonial art show will be Brown’s twelfth, but just the second since Tanner got involved last year and helped generate new verve for the artists by boosting the prize money and adding treats for collectors. That included a one-night-only sneak peek of all the best-of-show winners at 123 Gallery. She paired the winning objects with past winners by digging into the family vault and requesting loans from collectors, including an exquisite 1950s-era stamped-silver water canteen. She expected 100 visitors; she got 400. “Some of the locals told me it inspired them to go see the full show at Red Rock for the first time in years,” she says. At the same time, Lazarz was helping the city develop the Native Arts Market downtown. Its inception raised a few cries among Ceremonial boosters that it competed for their customers, but its backers say it provided an additional lure to out-of-town visitors. Ceremonial can pack hundreds of artists into an exhibition hall surrounded by drumming, dancing, and rodeoing. The Native Arts Market last year featured 43 artists. This year, it pairs with Santa Fe’s Keshi Foundation, which mounted a Zuni Art Show during the past two years of Santa Fe Indian Market. Keshi’s artists will instead appear at the Native Arts Market, August 9–11; Ceremonial’s art show is August 9–12. Both encourage artists to bring their materials and demonstrate their processes to help buyers understand the labor and the materials that constitute authentic Native American art. Zuni jeweler Jessie Dwayne Johnson traveled a similar fair-to-fair road while perfecting his family’s traditional petit-point pieces—silver jewelry bearing patterns made by tiny bits of carved turquoise and other stones. He plans to exhibit at both the Native Arts Market and Santa Fe Indian Market but notes that those back-to-back events challenge an artist’s wallet: While he slowly builds an inventory that includes two-sided corn maidens with heavy silver and a galaxy of gemstones, Johnson’s children still need to eat. Most artists break down and start selling pieces to traders to make the rent, he says. But many traders prefer items that sell quickly, rather than way-out-there innovations. Rose Eason, director of Gallup Arts, says her group helps change that by creating new markets and training artists to build their sales skills. He’s packing up the pieces and more fresh clay for that evening’s ArtsCrawl, and by the time it kicks into gear, downtown Gallup has blossomed into a community party. Visitors wander through a new exhibit at 123 Gallery, have their caricatures drawn, and meet some of the makers in an art-therapy space next door. A block away, Dave Baker explains how he collects dead and down wood for his carvings at Makeshift Gallery, a cooperative of nine local artists. A Navajo band blasts outlaw country in the middle of Coal Avenue. High schoolers screen-print T-shirts. Vendors sell frilly aprons, beaded bracelets, and chicken-sausage gumbo (with a vegan option). The granddad of Gallup art events takes place during Inter-Tribal Indian Ceremonial, August 3–12 at Red Rock Park. Besides its powwows, dances, a Navajo-language open-mic night, rodeo, and pageant, two parades march through downtown. On August 7, 123 Gallery (123 W. Coal Ave., 505-488-2136, galluparts.org) features the best-of-show art winners. The full show runs August 9–12 at Red Rock Park (505-867-3896, gallupceremonial.com). The city’s Native Arts Market, August 9–11, showcases juried artists in the downtown area (505-867-1227, gallupnativeartsmarket.org). ArtsCrawl is the second Saturday of every month, 6–8 p.m., sponsored by Gallup Arts, which also oversees exhibits by Native and non-Native people at 123 Gallery and hosts hands-on art events. Gallup Arts&apos; Loom Indigenous Art Gallery (209 W. Coal Ave., 505-870-2490) features small monthly exhibits. See art by local residents and enjoy the best cuppa in town at the Gallup Coffee Company (203 W. Coal Ave., 505-410-2505, on Facebook). Makeshift Gallery represents nine local artists’ woodcarvings, jewelry, paintings, and pottery (1710 S. 2nd St., 505-863-5249, on Facebook). Trading posts abound. Three longtime stalwarts are Tanner’s Indian Arts (237 W. Coal Ave., 505-863-6017, tannersindianarts.com), Perry Null Trading (1710 S. 2nd St., 505-863-5249, perrynulltrading.com), and Richardson’s Trading Company (223 W. Route 66, 505-722-4762). Artists bring their wares directly to customers at two of Gallup’s favorite eateries, Jerry’s Café; (406 W. Coal Ave., 505-722-6775, jerryscafenm.org) and Earl’s Family Restaurant (1400 Route 66, 505-863-4201). Score jewelry, beadwork, and pottery at the Gallup Flea Market (340 N. 9th St., on Facebook) on Saturdays. Bring your appetite for fry bread, mutton stew, and fruit pies, too. Numerous chain hotels can be found in Gallup. For a taste of history, consider El Rancho Hotel, with its grand lobby, restaurant, and a shop selling Native art (1000 E. Route 66, 505-867-9311, route66hotels.org). Want more on all things Gallup? Go to galluprealtrue.com.